Drawing inspiration from the most cutting-edge beauty fresh from the catwalk, Maybelline makes it easy to make a statement and flaunt your individuality and beauty. Maybelline are the number one cosmetics company in America that started out as a family-owned business. From these humble beginnings, Maybelline is the go-to for makeup products that help you explore your creativity. 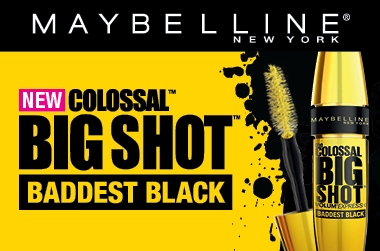 With scientifically advanced formulas designed for performance and trendsetting shades that are up-to-the-minute, Maybelline are leading the beauty revolution. Adore Beauty is an official stockist of Maybelline, with free Australian standard shipping. Showing 20 products of 35. Fine tip gives a nice thin line, colour is a good dark black and it's very easy to use. I find it lasts really well too, especially if I've used my Mayelline Colour Tattoo cream eyeshadow as a base - I can fall asleep with my makeup on and wake up to find my eyeliner hasn't budged at all. It does dry out after a while, but for me it's always lasted long enough to provide pretty good value for money. I originally got this as a gift but have repurchased a few times since then. I have the Benefit Roller Liner now which I think I prefer but for the price, the Maybelline is great and outperforms other drugstore felt tip liners I've tried. I bought this to take on a trip, as I didn't want to pack too many separate products or take anything too expensive that might end up broken or left behind somewhere. I was so impressed with it and have recommended it to everyone since then! The contour is more of a bronze shade than a traditional cool grey-brown contour powder, but it's not overly orange - more like a cool-toned bronzer - and I actually prefer that for a subtle summer holiday look. The blush is a really pretty shade and the highlighter gives a lovely subtle shimmery glow. Some people have mentioned it's not very pigmented but I don't like my highlighter to have an obvious colour, at least not for a daytime look on holidays. I did find I could build it up for a big night out and get a great look. I found all the shades applied and blended nicely too. If you're after a strong contour and blinding highlight this palette isn't for you, but if you want a subtle daytime look, or if you're a beginner or just not a big makeup person, this is fantastic! The sleek packaging is perfect for travel too, and I also use it on my eyes. The value for money is great but I think it holds its own with mid-range products too.